Sony has started a sale on the US PlayStation Store. 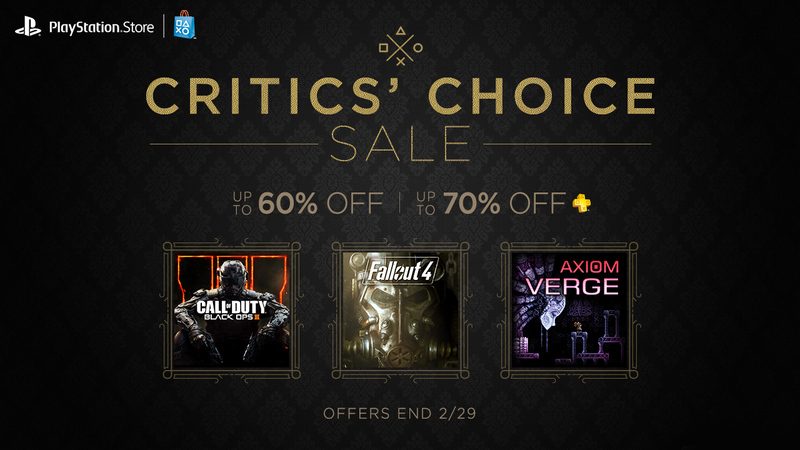 The “Critics’ Choice Sale” puts many well reputed titles on sale. This is the best sort of sale if you ask us. Because who wants to buy bad games at a discount? Though you’re going to have hurry up if you want to cross the titles off your wishlist. Because the sale lasts only till March 6th. If you have a membership to PlayStation Plus, you will have a bigger percentage off, as usual. This is another incentive to join PlayStation Plus if you haven’t already. The PlayStation Plus is $9.99 per month. You can also get it for $59.99 per year or $29.99 per quarter yearly. All prices are in USD. As always, there will be more titles on PS4 over the older titles on PS3 and PS Vita. This is expected, but it would be nice to see some more attention for the PS Vita owners. Discounts vary from 50% to 10% off. And we’re sure you can find something that’s worth your consideration. Some older titles for sale you might not have picked up yet are sure to be found here. The Last of Us Remastered, Grand Theft Auto V, The Witcher III: Wild Hunt Complete Edition, What Remains of Edith Finch. These are but some of the titles available right now for purchase. All of them are must-buy titles, so if you haven’t, get out your wallet right now. What Remains of Edith finch is an indie title that has seen much critical acclaim since its launch. The game plays out more somber than any other in recent memory. If you had to spend your money on only one game this week, we whole heartedly recommend this one. In fact, you can also take pride in the fact that your money will go to some hard working indie developers; so it makes it the best item on the list. But for you reference, you can find the full list of titles available at the Critics’ Choice Sale here.